The Ultimate Surf & Fitness Package. 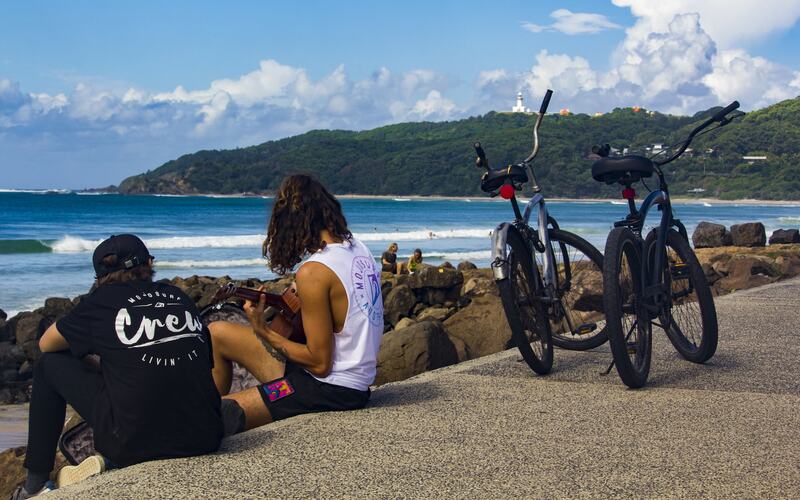 The Byron Bay area is known not only for its great surf waves, which are experienced and learner friendly alike but also for its amazingly laidback lifestyle and culture. So why not stay a few days, have a few surf lessons, get fit with crossfit or ocean kayaking and see what this great surf/beach town has to offer! A key part of the surfer lifestyle is being fit. This 2 to 7 day learn to surf package plus crossfit or ocean kayaking. Mojosurf will take care of everything for you. All you need to do is get here. We’ll sort out your accommodation, breakfasts, lunch and dinner. We’ll come and pick you up at your door, bring you for an amazing surf lesson and have you back in time for happy hour. On top of this you can swap a surf lesson on any day for a crossfit session or ocean kayaking. Crossfit sessions are conducted at Byron Bay Crossfit run by 2 x world champ Amanda Allen conveniently located 15 minutes’ cycle from our surf camp (we provide you with a bike) 6am, 9.30am or 5,30pm Monday to Friday and 8am on Saturday, so you can have a sleep in! Or swap your surf lesson for a ocean kayaking experience with the dolphins 7 days a week morning or afternoon. The ultimate surf and fitness package! Depending on how long you stay, each day includes a surf lesson or swap for a crossfit or ocean kayaking. 2 hours of bike hire is also included daily. BUS: Loka Travel, Greyhound, Premier, Oz Experience, Bamba and other bus services stop at Byron Bay daily. FLY: The closest airports to Byron Bay are Ballina/Byron or Gold Coast airports. SELF DRIVE: Just look up Byron Bay on any map! Once in Byron Bay, check into the Mojosurf Camp by the Arts Factory, 1 Skinners Shoot Road, Byron Bay. Breakfast starts at 7am and available until around midday from the Arts Factory Café. Surf lessons for Surf & Stay packages normally start in the morning with pick-up from our camp. On top of this you can swap a surf lesson on any day for a crossfit session or ocean kayaking. Crossfit sessions are conducted at Byron Bay Crossfit run by 2 x world champ Amanda Allen conveniently located 15 minutes’ cycle from our surf camp (we provide you with a bike) 6am, 9.30am or 5,30pm Monday to Friday and 8am on Saturday, so you can have a sleep in! Or swap your surf lesson for a ocean kayaking experience with the dolphins 7 days a week morning or afternoon. 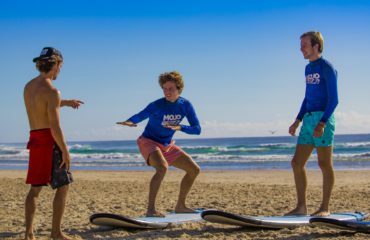 From the moment you arrive in Byron Bay you will feel a real surfy, artsy vibe, which will reach its peak when you arrive at the Mojosurf Camp in Byron Bay, located by the world famous Arts Factory lodge. 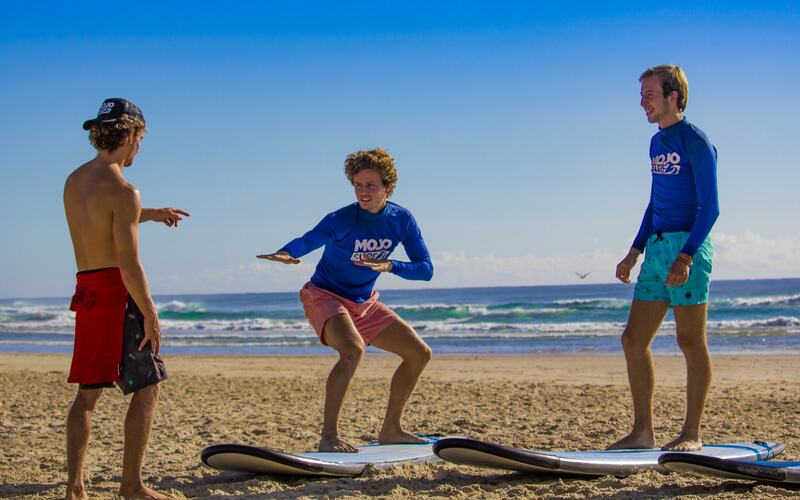 The Mojosurf Camp Byron Bay is the perfect place to meet new friends, surf together, and explore the sights of Byron. There are numerous other activities and workshops around the camp including Didgeridoo making, African drumming as well as the famous Bush Tucker walk and bracelet making with Cockatoo Paul. For down time you can just chill by the pool, relax in a hammock, or even join in a game of table tennis, pool, basketball or volleyball. It is also only a 10 minute walk into town which is ideal for exploring all the sights and relaxing on the beach. The Mojosurf Camp Byron Bay is made up of a funky tipi village in the rainforest. Each tipi has 4 single beds, which are fully made up. There are shared bathroom and kitchen facilities. There are twin and double upgrade options, however these are subject to availability and you need to contact Mojo directly to confirm. Please note in the winter months we stay in dorm rooms as the tipi’s get a little chilly. Every Tuesday night in the Arts Factory a whole host of talented individuals perform, ranging from musicians, right through to comedians and mime artists. The camp is also located right next to the Byron Bay Brewery which has a host of DJ's, gigs and live performances in the evenings. Our guides will also show you around the other copious amounts of places in town to see live music, DJ’s and dance the night away.